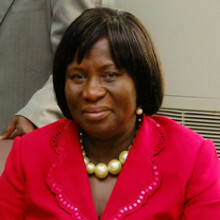 Martha Gyansa-Lutterodt is the Director of Pharmaceutical Services and also the Chief Pharmacist of Ghana. Martha is a product of Kwame Nkrumah University of Science and Technology, Ghana, Leeds University, United Kingdom and GIMPA’s School of Governance and Leadership. She serves on several national and international boards and also is a Lancet Commissioner on Essential Medicines 2015. She served on several Bilateral and Multilateral consultations on Trade Related International Property Rights as well as medicines policies.